Germany – Give Them A Free Pass On Carbon Offsets? This is an interesting little graph. It shows the “change of temperatures in a year”, that is the dT/yr, and the cumulative change over the life of all the thermometers, dT. What surprised me most when I made it was that it was so flat that the two lines were on top of each other. I had to make the dT/yr line semitransparent to make it readable. ( You ought to be able to click on the graph for a really big version). I was so surprised at the 1850 to date flatness that I extended it back to 1750 just to see if they were still stable in the far past. Yup. 260 years, flat. First off, this is interesting because the Germans are generally known for being real sticklers about issues of precision and quality. Not the sort of folks to cut corners on where or how temperatures are to be measured. Secondly, because other countries in the same general area do have warming trends in their data. And then there is poor Turkey, burning up in comparison. All of which argues for instrument error as much more likely than CO2. At least, I can’t think of any way for CO2 to “Give Germany a pass”. And yet Germany has a strong “Green” movement that is highly vocal about “Global Warming” and has policies promoting the various forms of carbon reduction. One can only guess that the politicians there don’t look at their own temperatures much. In that spirit, I hereby declare Germany a “Carbon Guilt-Free Zone”. Enjoy! This entry was posted in dT/dt and tagged Global Warming. Bookmark the permalink. It’s an interesting suggestion given that Missouri, which gets 85% of its electrical energy from coal, also has an almost flat temperature over the past 114 years , sorry that the derivation is a bit simplistic for this site. The moaning greenies could then try to make the politicians give away all the Carbon Tax money to their favourite Third World countries – and all citizens would know at once that it never was about CAGW and saving the planet, but about distributingtheir well-earned wealth, without them having a say. Chiefio this needs to be posted on WUWT . The world needs to see this ASAP. At last a base line to work against. One might ask whether the Co2 stays home or goes awandering? Maybe the concentrations (if any) don’t accumulate in the vicinity of the source. In re-reading my comment, it seems pretty moderate. I assume that your recent noteriety has resulted in an assault on your site by folks who should be seen and not heard. It’s too bad. yeah it does appear pretty flat to me… we still have snow here in Hamburg on March 11th, pretty unusual. Usually Hamburg barely goes below 0 degrees C in winter. Coldest temperatures since 1981. Cool phase of the PDO, i would say. Nice to see that you analysed Germany. In fact, i would have expected to see at least a little bit of the “end of the LIA”… surprising. Ja, das überrascht mich auch. But if you look about 1815 you see a very nice drop after the volcano and the low excursions are fairly low then. There are some stories about the LIA mostly being sporadic cold periods and then some relief. It may be that the ‘average anomaly’ does not capture the impact of a very cold December… If I get time I’ll look at the graph ‘by month’ and see if it has something interesting to say..
plotting (T sub(i-1)) and (T sub i) ?? REPLY: [ The first pass through the data is substantially the same as First Differences, with the exception that I do not reset on a data gap. The first data, for a given thermometer record, is the initial BASE or zero record. The next time that month for that thermometer has data (typically the following year record, but on a data gap it may go further) you compute the anomaly. T(sub1) – T(sub0) so if the start was 10 C and next year that month was 11 C you would have 11 – 10 = 1 C of “increase” or dT/yr would be 1 and that is how the basic data file is made. I then do a report from that file which starts in the present and reads backwards through the file. For each year it makes the average dT (so if you had 3 thermometers with +1.5 +1.1 +1.9 you would sum those three anomalies and divide by 3 to get 4.5 / 3 = +1.5 as the average dT in that year) then a running total of those averages for the geography in question is made (that is, if 222 is the country code, all of Asian Russia records would be in the file so you get the running total average increase for the whole of Asian Russia. You could also have specified a single thermometer, or any substring of the StationId. That is the dT column. This “backward time” step has the advantage of setting your present value as the norm based on the present thermometers (supposedly better and more accurate than those at the ‘start of time’ which for some places is in the 1700’s ) and ought to give a more accurate profile of change over time (that first 1700 era record, if 10 C high, could give a -10 C anomaly the next year that you could spend decades trying to work off ;-) For the present, with more than the single thermometer most places start with at the ‘start of time’, we ought to be getting very good average anomalies up until that 1700’s single thermometer odd duck hits. So the really early end is where the strange bits show up, if any, not the last 100 years. On my “to do’ list is to try doing the first ‘anomaly file creation step’ with backward time as well. I don’t expect anything of significance to happen, but it would be good to measure. (That ‘odd duck’ +10 that gives the -10 the next year would instead show a more or less neutral value in 1701 and a +10 in the last year. Basically, it would put the ‘oddity’ in the year that caused it instead of in the following year. Since it all happens in the first year or so of a place when it only has one old dodgy thermometer, I don’t see much urgency … but I’m going to test it any way. That’s the overview. Real Code, of course, has more details in it. But those don’t matter to the method. I’m going to post the code once I settle on a ‘forward time’ vs ‘reverse time’ for that first step of anomaly creation and make a more automated ‘wrapper script’ to run it. So in essence, I just look at monthly anomalies year to year, make an average of them for a given place, then “sum them up” starting now and looking back in time so we have a more appealing view. Basically, I wanted to make the ‘anomaly step’ happen as early as possible and be as pure as possible. Making an annual average THEN doing the anomaly has “issues” if a few months are missing and you are averaging data full of holes. Doing First Differences has issues with holes in the data. ( And “digging in the clay” have shown much of the data, near 50%, can be holes, so handling holey data is very important). So what have you got? Monthly Means. Make the anomaly with them, and do it as your very first step. And on a data gap, wait for that month to have a valid datum and then do the anomaly. (So a 5 year gap in July with a 0.1 C / year trend, would put a +0.5 C jump in year 5, but would preserve that trend rather than just drop it as F.D. does or fill it in with imaginings as The Reference Stations Method / Climatology does). These absolutely pure anomalies are then averaged for a year, for a place, and a running total is made. That is dT. At any rate, the goal was to make as absolutely pure an anomaly process as possible with no in-fill, no imagined data, no dropping, no resetting on gaps, no “Thermometer A” to “Thermometer B”, no “Basket” to “Basket” (and, horrors, certainly no “Basket A” to “Basket B”…), and no “averaging temperatures prior to anomaly creation”, and no UHI or other adjustments, modifications, etc. etc. etc. The NOAA GHCN database contains 11 stations in Germany that have long term data. A plot of these shows a distinct warming trend after the early 1980s. 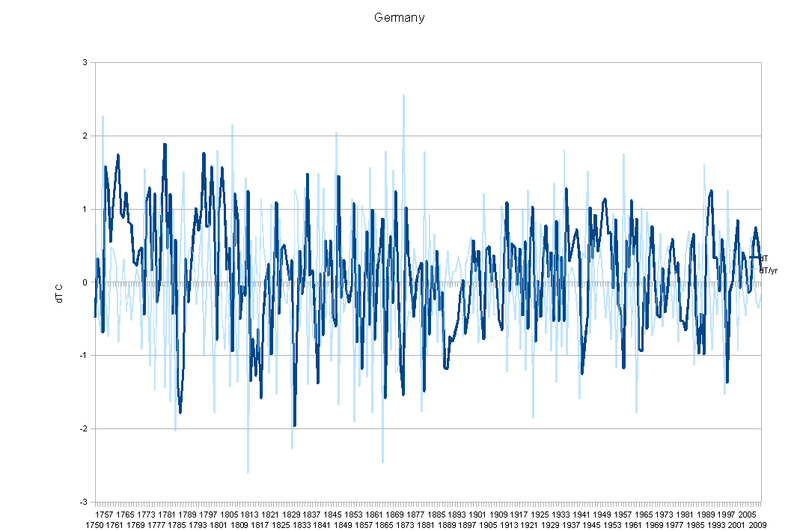 The CRU – CRUTEM3 database (5×5 degree grids) takes 4 grids to cover Germany – it shows a similar trend to the GHCN data. Why the discrepancy in the data? What is your Germany data source? REPLY: [ I can’t explain what other people do. I can speculate. i would speculate that, for example, GISS cuts off the data in 1880. Look at that graph with an 1880 cut off, you get a warming trend. Further, if you look at 1980 on the graph above, it is a cool point (more below the zero line than above) so a trend started then would also show warming. You can pick many warming start points and many cooling start points. So I’d speculate that the starting point might matter. What CRU and GISS do with ‘in-fill’, adjusting whatever can cause most any trend to happen for a given place. (There are many examples on WUWT of A/B blinkers showing cooling trends in the input data turned into warming trends in the result). So I’d suggest looking at their “start of time” being in a cold point and there process doing more than “The Data, and Nothing But The Data” for a given place. The only other thing I could add is that the graphs to which you link show a baseline several decades long and some are using grids. So they are not pure anomaly of “self to self” incrementally. They are anomalies relative to a computed average baseline. So a thermometer that did not exist in that baseline will be compared to some other thermometer. Anomaly of “Thermometer A” to “Basket B” or some such. Not very “pure”… So like I said, I can’t explain why other folks do what they do. I can explain what I do and why. My source for the Germany data is the NOAA / NCDC GHCN “unadjusted” data set from February 2010 download. And there is nothing added to it in any way by my processing (a little is taken away in that I average things together and averaging is used to hide detail). I create anomalies as the first step (though this uses ALL the available data, so may diverge from the ‘long lived’ set) and average them per year. That’s pretty much it. (With some details about when to start time). It was intended to be a “Dirt Simple” anomaly process, so there really aren’t any “frills” in it to complicate things. This is “young code” in that I’m still polishing it. There is the possibility that I’ve got an undetected bug in it, but I don’t think so (what programmer ever does ;-). It reliably finds warming trends in places, like Turkey, that have a rosy patch on the GISS map and it reproduced what I know of the USA history well. For those who get grumpy when I do tables, this will make you grumpy, so don’t look. I just don’t feel like dealing with all the graph making stuff right now just to answer a question. I took the input data to the above chart and selected only those records with a “0” modification flag. This may not be the same as the “11 long lived” but will have significant overlap. (The ‘count’ rises to 20-30 in some parts) The first thermometer somewhere is typically the “0” mod flag, so this ought to be the “old musty ones” but will also include some “young but new” and some “old with big gaps” so not ‘long lived’ by some measures. The report does show a warming trend from 1980 to date. So the answer to the above question about why those graphs of those 11 stations shows a warming trend is the same “Selection Bias” in this report. That particular sample shows that trend. For any given year, you ought to be able to add up the monthly anomalies and divide by 12 to get the annual average anomaly (dT/yr) and then add that to the dT to get the next year value for dT. You may need to shrink the font or look at ‘page source’ to see the full width of the report – for folks wishing to check it. OK, here’s the report. It’s the dT column you want to look at and it’s going to show a negative number in the 1980’s. I cut this one off at 1750 (just like I cut the above graph off at 1750) as that’s the place where Germany drops to 1 thermometer and things get more volatile (and probably less reliable). So 1.2 dropping to -0.8 is total change of -2.0 in January 1751. Then we have 4 missing years, but when January shows up again, we have a -5 C change. Etc. The -9999 is a missing data flag and ought to show up as zero in the anomaly field. They get rather upset at the glacier on top of the Zugsptize melting. They cover it up in summer to try and halt its demise. Strangely enough it isn’t actually ever warmer Summers that cause the worst of the melting – it is rain. Warm rain falling on the ice causes rapid melting of the glacier surface. Got a feeling that this has been going on for quite some time? Nevertheless there remains much hand-wringing amongst German environmentalists about global warming, and the response has actually been to apply yet more technology to counter the alleged impact of… all the technology. Typically German – not in their nature to give up on technology just yet. Of course the German’s see AGW as a money spinning opportunity and are working hard on wind turbine, carbon sequestration, low-energy lighting, solar energy and other low-CO2 technologies. So the German response to AGW is actually to consume more of the world’s resources to combat it – I’m not sure that was quite what the environmentalists had envisaged. I have done a pilot study of six Australian sites, scattered right over the country. I have sent it to WUWT but so far no response. Half of the sites have rapid increases in temperature, the rest moderate or none. The difference between these two groups is in the monthly mean maximum temperatures – the minimum means clump quite closely. The other unexpected factor is that it is the maximums that are accelerating in the growth sites, not the minimums, which the UHI theory would predict. My main point however is that the temperature gradient for each site is very constant (some going back to the 1850’s). It seems as though individual places have their own micro climates with persisting degrees of warming or cooling. Your all of Germany bears that out. I seem to remember that Anthony had a similar study of rural stations in the USA. You may care to examine individual German sites and also look at seperate monthly averages for maximums and minimums. REPLY: [ Yeah, the whole MAX vs MIN thing keeps nagging at me as something I ought to do. But I was driven to get the dT code done first. At this point, though, it’s darned near trivial to do the same thing on the v2.min and v2.max files and be able to put up 3 lines on a graph and say: Hmmm now that’s interesting…. So, yeah, at the end of the day it is looking more and more like a bunch of micro-climates that wander back and forth on several decade to hundred year cycles (like that 1934 hot America / cool Indian ocean thing) and depending on what bag of thermometers you grab, you get a different “global warming” answer… And perhaps with some equipment change bias thrown in for seasoning and ‘low lows’ clipping as Stevenson Screens leave the “grassy knoll” and electronic gizmos get put on a short electric cord near the building… ( I do wonder how you can feed power into a tin can and NOT have a tiny bit of it hanging around inside the can making it just a tinsy bit slower to cool off than an old wooden ventilated box with no power feed… but that’s just a nagging suspicion at this point). Chiefio, I can’t see somewhere to comment on your Roasting Turkey Article. I was wondering if you would like to look at Warwick Hughes website, he has the old (pre 2000) CRU datasets over there including Turkey up to 1999. It might be worth comparing them to the current values that you used in your analysis to see if they have been adjusted since 2000. Here is the code that does the actual creation of the anomaly part. It is pretty trivial. It is not fully commented (missing my usual identification section for one thing… and the copyleft… and..) and I’ve not given it a final ‘preening’, but it’s what I’m running. Also note that it says it expects a special form of the v2.mean file with the inventory data concatenated on the end of each line. That is for future experiments involving selecting records via the A Airstation flag or the population or RSU Rural/Sub/Urban flags. It does not strictly require that format at present. Ok, enough mealy mouthed “it’s not done yet”… I said it’s a “Work In Progress”, so here it is. C     output file have metat data after each dT/dt line. In 2004 they are both about 1/3 C then they diverge ( the Zero Only report also “takes a big gap” from 1991 to 1995 and we find 1995 divergent between to two by rather a lot at 1.67 C of divergence (absolute range). Then there is another discontinuity in about 1988. That divergence, with some minor wandering back and forth, then persists onward as the ‘changes’ in the two series are not big enough to erase it. So it looks to me like the “difference” is whatever was done to the instruments during that “Gap and Trade” where we have thermometer dropping and swapping going one. So we take a bunch of instrument changes, and depending on how you account for them you get warming, or not… “The Other Guys” do a lot of “in-filling” and “interpolating” and “correcting” and splicing Mod Flags together and find warming. I look at each instrument series as a “self to self only” anomaly and find no warming. Chiefio, that is wierd, I can see the Comments for all them now.